It is that time of the month again when Samsung Galaxy S7 and S7 Edge update for August brings new security patches from Google. Being the flagship devices, S7 is the first to receive the latest updates, which usually doesn’t mean anything special. However, Samsung does have something more than just bug fixes and optimizations for S7 and S7 Edge users. 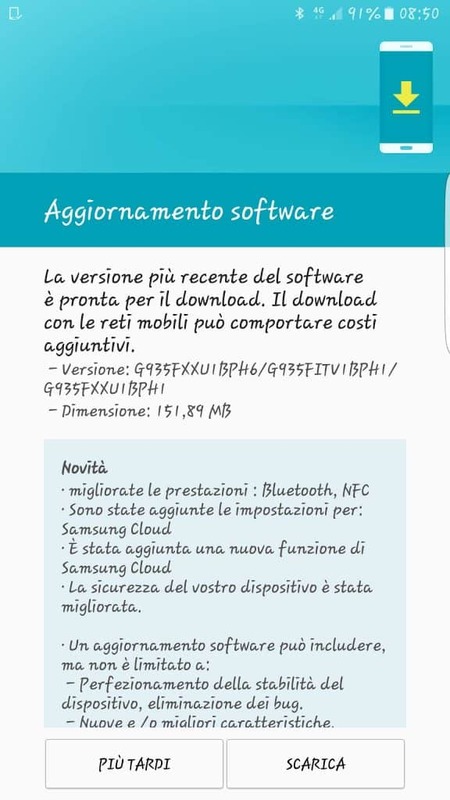 The rather large 151.89MB update file is not only comprised of July-August security patches, but also the Samsung Cloud service. A competitor to Google Drive and Apple iCloud, Samsung Cloud has debuted on the latest Galaxy Note 7. Galaxy S7 and S7 Edge update with Samsung Cloud is expected to offer users 15GB free storage space. Samsung cloud service will soon make its way to Galaxy S6, S6 Edge, S6 Edge+, and the Galaxy Note 5. The latest update is currently rolling out for users in Italy and should soon be available worldwide in the coming week. Apart from the July 5 and August security patches by Google, you can expect NFC and Bluetooth improvements as well. To check for the latest available update manually simply open Settings->About phone->Software update->Check for updates. You can also keep an eye out for all the latest available Galaxy S7 and S7 Edge update on our Samsung firmware platform. Do keep us posted on all the improvements and new features you notice in the latest update.